We have standardised the Room Hire Rates with effect from 14th July. See MEETINGS in the Main Menu and Download the PDF file for easy reference. The pilgrimage to Santiago de Compostela in northwest Spain owes its origin to the discovery, in what is now Galicia, of the tomb of the Apostle James the Great sometime early in the 9th century. It probably achieved its greatest popularity in the 12th century, when it came to rival Rome and Jerusalem as goals of Christian pilgrimage, and though it declined thereafter, it has never been entirely forgotten. John Beirne, enjoying a coffee, before starting out on his journey to Compostella. This year he will celebrate his 71st birthday en route. He is hoping to raise awareness of the historical importance of this pilgrimage which used St James Bristol as a starting point. 2/6/2014 We have already received £50 in sponsored donations for John’s walk. 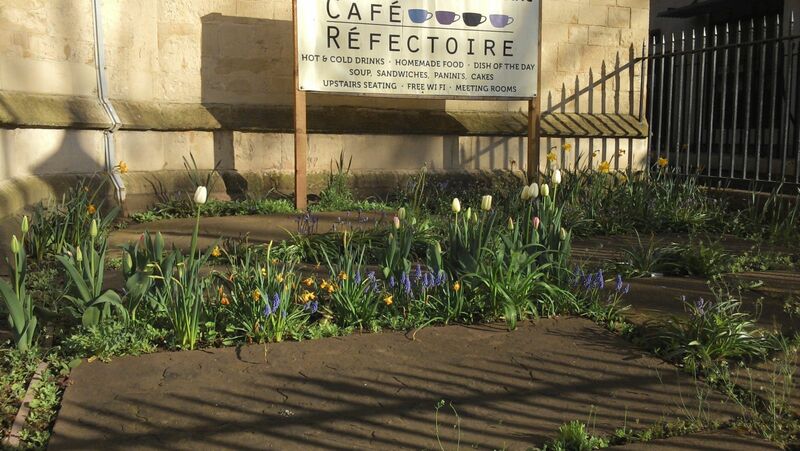 Lloyd's Bank Volunteers planted bulbs in the South Garden back in November 2013. Here is the result of their labour. THANK YOU !! The memorials that have been restored in the church have interesting stories. A group of volunteers have been researching the history of these memorials. The War Memorials for St James Priory and St Peter's Church have also been researched. This is now available to view and download. 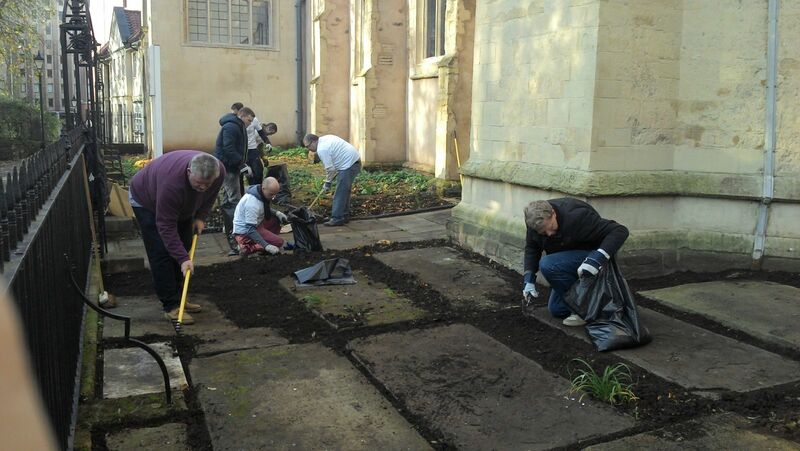 On 26th November we had 23 volunteers from Lloyds Bank Bristol giving their time and effort to help our Charity. 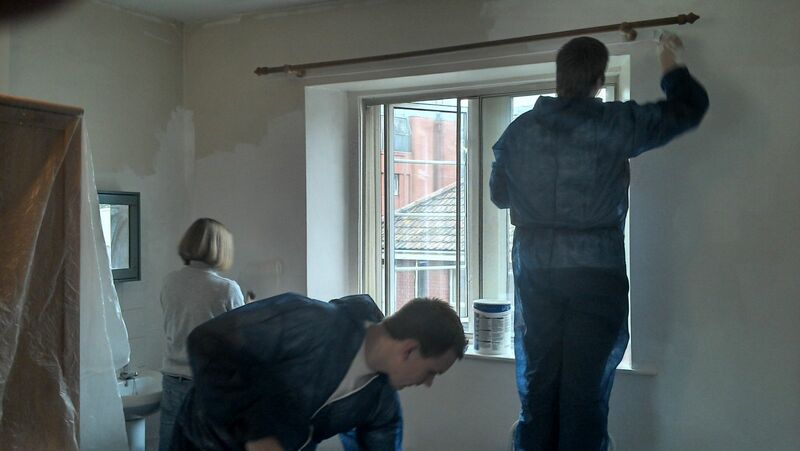 They spent the whole day at the Priory helping us with Painting, Gardening, IT and the Cafe. We are extremely grateful for this invaluable support and hope to see them again next year !! The Lord Mayor of Bristol will open this Exibition. Please come along and view the photographs. The website has been updated. You will notice different menus which will allow you to more easily find and access the information you require. EG. The calendar is now a separete menu at the top of the page and the Cafe has its own page.. Between 14th May & 29th May the church will open from 10am until 2pm – Monday – Friday. Mass on Sundays is at 8am. This is a TOP local company and highly recommended by us. Polite,friendly and excellent service. They have provided a Tower on 2 separate occasions to help us out. Many thanks to Keith and the Team. Mass at St James on Easter Sunday is at 8am. The Church will be closed on Good Friday and Easter Sunday. The church is open Monday - Friday from 10am - 5pm. Access is from Whitson Street or via the cafe. St James is not a Parish Church and has no regular income from a church congregation. Please consider making a contribution to maintain this Heritage Building for Bristol and the Nation. Also we continue to rely on donations for our charitable work of supporting vulnerable people. The Church will be closed on Good Friday, Easter Saturday and Easter Monday. Mass on Easter Sunday will be at 8am. Please contact St Mungos for further information. St James House is an independent supported housing provision. The service provides housing support for single people in recovery from addiction for up to 24 months. Referrals will be accepted from individuals as well as agencies. Please contact us for a referral or if you would like further information. Washers-up for Cafe, hours to suit. Call in to see the Cafe Manager. Mass is celebrated every Sunday at 8am. From 7th May 2019 Abbot David Charlesworth (OSB) will be the celebrant for the 8am Sunday Mass. On Tuesday – Saturday he will be hearing Confessions at 12.30 and will celebrate Mass at 13.05. EASTER SATURDAY – Church & Cafe closed. EASTER SUNDAY — Mass at 8am. EASTER MONDAY – Church & Cafe closed.